GS Petroliers celebrated 2016/17 title as they won both Final games against NA Hussein-Dey. 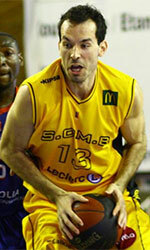 GS Petroliers posted a 75-71 win in the opener and then won 94-61. Mohamed Seddik gave his team a 38-24 halftime advantage, while Faycal Belkhodja (192-G-88) nailed three for 64-32 lead. With this success the Petroliers won the 19th championship of their history, the 4th consecutive.